In keeping with the theme of evolution and nutrition, today’s article is going to be the first installment of a two-part series on the Paleo diet (also called hunter-gatherer, Stone-Age, or ancestral dieting). Even if you are not familiar with Paleolithic nutrition per se, you most likely are familiar with Atkins, The Zone, or South Beach, which are essentially less-strict versions of ancestral eating. However, given their differences, we won’t concern ourselves with them and will therefore just stick to looking at Paleo. Part 1 will solely place emphasis on the Paleo diet and some of the inherent biases/contradictions it contains. Part 2 will strictly be reserved for a research review on the literature supporting the Paleo diet, wherein I will make some final comments and sum things up. My goal for today is to show you all why Paleo is a flawed and inflexible diet system comprised of ideologues who cement themselves in assumptions while blindly disregarding scientific literature that opposes their own views about nutrition. So, without further ado, let’s begin by taking a look at what Paleolithic nutrition actually is. It is from this rationale that Paleo fanatics believe that obesity, diabetes and the other “diseases of civilization” are caused from the consumption of grains – or as they like to call them, “the double-edge sword of humanity” – because these diseases were not a problem back then when grains were unavailable. However, today, both an overabundance of grains and diseases are available. Therefore, no post-agricultural foods are to be consumed because they somehow contradict our genetic disposition. As extremist as this is, many people are taken in by this philosophy because it does offer a very logical explanation for the current health crisis we are now witnessing. What most Paleo nuts choose toforget is that we also did not evolve with television, computer, cars, etc. that lowers our energy expenditure and potentially leads to weight gain and certain diseases when combined with poor dietary habits. Yet, most of them continue to use these things on a daily basis; hypocrisy? I’ll let you decide. That’s another article for another time; today’s focus is strictly nutrition. Now, I have to say that I am in agreement with the idea that a diet which is full of McDonald’s, Dunkin’ Donuts, and other processed foods is not the healthiest diet to consume; no argument there. However, if you’re trying to debate that oatmeal, milk and a little bit of sugar here and there are bad for me, then Ihave a problem. But, before I get ahead of myself, let’s see if we can actually quantify what a “caveman” actually ate all those years back. What did a Caveman Actually Eat? In a few words: we can’t be sure and probably never will. However, even crazier than the people themselves are their claims that they, the Paleo proponents, actually know what a caveman ate. In one of the first papers talking explicitly about Paleolithic nutrition, authors Eaton and Konner provided some general ranges for the types of food sources a person might have eaten back then based off of some more recent hunter-gatherer societies which lasted into the late 20th Century . Although this serves as a rough estimate for Paleolithic nutrition, one must keep in mind that a hunter-gatherer culture living in the 1960’s is extremely different from that of a Paleolithic society living hundreds of thousands of years ago. Any suppositions made from these observations are purely speculative and far from conclusive. Nevertheless, using these contemporary hunter-gatherer societies (living mainly inland and in semi-tropical climates), Eaton and Konner saw that anywhere from 20-50% of their diet was obtained from meat and anywhere from 50-80% of their diet came from vegetation. However, populations in artic regions – like that of the Eskimos – derive as little as 10% of their diet from plant-based sources. Therefore, if my calculations serve me right, the ranges of nutrients potentially run anywhere from 20-90% meat-based and anywhere from 10-80% plant-based. To me it seems as though there was not one single hunter-gatherer-type diet. In fact, a well-written review by evolutionary archaeologist, John Gowlett , argues that in no way there could have been only one “Stone-Age diet.” This is due to various geographical limitations, such as food variety and climactic changes, which would require various nutritional adaptations to be undertaken in order to survive in a given region. Therefore it can be determined that humans did not evolve eating any one type of diet, but rather an all-encompassing and extremely varied diet that would allow for adaptive survival given their geographic location/conditions. This is exactly what was seen in our more recent hunter-gatherer proxies. But does that stop the Paleo zealots from prescribing strict nutritional guidelines? Led by Dr. Loren Cordain – who, to his credit is published in a multitude of peer-reviewed journals – the Paleo diet is characterized by two food-lists; foods you can/should eat, and foods you should avoid at all costs (lest you not fear for your own health and well-being). Boiling it down even further, foods to consume and avoid are provided below, along with picture for those who are visually inclined. You’ll notice they have a pretty rigid set of dietary guidelines. Furthermore, if you’ve ever read Cordain’s book (The Paleo Diet), you would have noticed some percentages for protein, carbs and fats (pg. 11) . In fact, they all fall well within the ranges noted earlier. However, like I already mentioned, we don’t know what a caveman ate! Providing your own dietary ratios for macronutrients is nothing more than using a blank slate with which to project your own views about diet composition. Disobey these dietary dogmas and I assume it’s like Scott Pilgrim vs. the World when the Vegan Police come and take Todd’s vegan powers after drinking a latte made with half and half. Well, maybe not that bad, but you’d probably be ostracized on some level. Now that we’ve pointed out a few of the biases and contradictions contained within the diet’s ideology, I think it’s only fair to point out some of the benefits that a Paleo diet can offer…and then some of the benefits from foods Paleo dieters choose to avoid. You didn’t think I would let them off the hook that easily did you? Nothing Paleo zealots do make any logical sense. Based on what we just saw, going Paleo primarily consists of lean meats, seafood (with an emphasis on omega-3s), fruits, vegetables, and various nuts and seeds which also contain some “heart-healthy” fats. As a nutrition student, I would be lying if I said I disliked any diet that advocated for such a healthful array of foods. In fact, the scientific literature supporting the benefits of said food types runs the gamut. Fruit and vegetable consumption is consistently associated with reduced risk of coronary heart disease [5, 6], stroke [7, 8], type II diabetes [9, 10], and even some types of cancers [11-14]. Similarly, omega-3 consumption (either via supplementation or fatty-fish consumption) has been shown to reduce certain cardio-metabolic risk factors  as well as incidences of many chronic inflammatory diseases such as IBD, cancer, rheumatoid arthritis and Alzheimer’s . There is even starting to be some strong evidence for the use of omega-3s, specifically EPA, in the treatment of depression . Lastly, nuts have been implicated in the improvement of cholesterol levels, oxidative stress, blood pressure, inflammation and other cardiovascular risk factors [18, 19]. Ideology aside, the literature seems to support the basis of Paleo, but what about the foods they don’t consume? Paleo Dieters are Missing Out! Although the foundation of Paleo is bolstered by scientific literature that confirms the plethora of health benefits to be expected when one eats fruits, vegetables, nuts and lean sources of meat, what the Paleo extremists seem to be flat-out ignoring are the health benefits from foods they’re excluding – nay, unjustifiably denouncing! In the interest of time I’ll stick to the major food groups noted on the ‘avoid’ side of the above Paleo manifesto, those being grains, legumes, and dairy. Starting with grains and legumes, whole grains have been associated with having protective effects against the development of type 2 diabetes , coronary heart disease [21, 22], and stroke  while both are associated with improvements in glucose, lipid and lipoprotein metabolism in both healthy and diabetic populations . Furthermore, in a recently published review looking at 135 studies on refined grains – namely breads, pastas, rice and cereals – it was shown that there was no association between refined grain consumption and an increase in disease risk, even when 50% of grain consumption came from refined grain products . So, at the very worst, there’s no ill effect of refined grain consumption, as long as it doesn’t comprise the majority of your diet. At best, you get all of the above-mentioned health benefits from whole-grains and legumes. Paleo zealots, however, just look the other way. In fact, a study—which we will look at next week—that compared a Paleo diet to a traditional diabetic diet saw that calcium was significantly lower (~50% less) in the group adhering to a Paleolithic diet . Furthermore, there has been accumulating data to suggest that dietary calcium further improves weight loss/management [30-32] and is responsible for up to 50% of the anti-obesity effects of dairy . Those seeking to add muscle would most certainly benefit from the consumption of dairy products due to its shown effects on strength and muscle gains when combined with resistance training [33-37]. Moreover, a fractional component of milk protein, whey, is commonly used in supplements and has been shown to enhance muscle hypertrophy and recovery from heavy lifting, as well as decreasing muscle damage and soreness . It has even been argued to be the “ideal” protein source for stimulating muscle protein synthesis . Lastly, whey protein is even implicated as also having anti-obesity effects, complementing those of calcium . This, in part, seems to be due to the high content of the amino acid Leucine seen in whey protein. Obviously a good case can be made for not adhering to a Paleo diet due to the quantitative benefits offered by the foods that are not eaten – in reality, decried – by Paleo dieters. 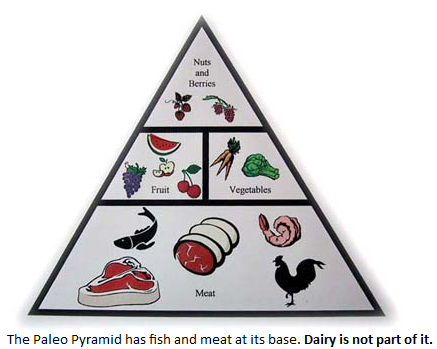 So, as you can see, there are some pretty stark contradictions within the Paleo way of eating. Not only do Paleo advocates follow a rigid diet based on loose assumptions of ancestral food patterns (which they’re wrong about in the first place), but they also make adjustments to their philosophy where they see fit, even if it deviates from their core principles. To me it just sounds like an excuse to impose one’s own views about nutrition on others. Next week we’ll take actually take a look at some studies that support Paleo diets and see whether or not Paleo lives up to all the hype, regardless of how flawed its ideology is. So until then, keep enjoying your oatmeal and protein shakes. I sure know I will! 1. Eaton SB, Konner M. Paleolithic nutrition: a consideration of its nature and current implications. NEJM 1985;312(5):283-289. 2. Gowlett JAJ. What actually was the stone age diet? J Nutr Environ Med. 2003;13(3):143-147. 3. Ravedin A, Aranguren B, Becattini R, et al. Thirty thousand-year-old evidence of plant food processing. PNAS 2010;107(44):18815-18819. 4. Mercader J. Mozambican grass seed consumption during the middle stone age. Science 2009;326:1680-1683. 5. Dauchet L, Amouyel P, Hercberg S, Dallongeville J. Fruit and vegetable consumption and risk of coronary heart disease: a meta-analysis of cohort studies. J Nutr. 2006;136(10):2588-93. 6. He FJ, Nowson CA, Lucas M, MacGregor GA. Increased consumption of fruit and vegetables is related to a reduced risk of coronary heart disease: meta-analysis of cohort studies. J Hum Hypertens. 2007;21(9):717-28. 7. Dauchet L, Amouyel P, Dallongeville J. Fruit and vegetable consumption and risk of stroke: a meta-analysis of cohort studies. Neurology 2005;65(8):1193-7. 8. He FJ, Nowson CA, MacGregor GA. Fruit and vegetable consumption and stroke: meta-analysis of cohort studies. Lancet 2006;367(9507):320-6. 11. Gandini S, Merzenich H, Robertson C, Boyle P. Meta-analysis of studies on breast cancer and diet: the role of fruit and vegetable consumption and the intake of associated micronutrients. Eur J Cancer 2000;36(5):636-46. 12. Conway DI. Each portion of fruit or vegetable consumed halves the risk of oral cancer. Evid Based Dent. 2007;8(1):19-20. 13. Pavia M, Pileggi C, Nobile CG, Angelillo IF. Association between fruit and vegetable consumption and oral cancer: a meta-analysis of observational studies. Am J Clin Nutr. 2006;83(5):1126-34. 14. Riboli E, Norat T. Epidemiological evidence of the protective effect of fruit and vegetables on cancer risk. Am J Clin Nutr. 2003;78(3 Suppl):559S-569S. 15. Abeywardena MY, Patten GS. Role of ω3 Longchain polyunsaturated fatty acids in reducing cardio-metabolic risk factors. Endocr Metab Immune Disord Drug Targets 2011;11(3):232-46. 16. Wall R, Ross RP, Fitzgerald GF, Stanton C. Fatty acids from fish: the anti-inflammatory potential of long-chain omega-3 fatty acids. Nutr Rev. 2010;68(5):280-289. 17. EPA but not DHA appears to be responsible for the efficacy of omega-3 long chain polyunsaturated fatty acid supplementation in depression: evidence from a meta-analysis of randomized controlled trials. J Am Coll Nutr. 2009;28(5):525-42. 18. Ros E, Tapsell LC, Sabate J. Nuts and berries for heart health. Curr Atheroscler Rep. 2010;12(6):397-406. 19. Ros E. Health benefits of nut consumption. Nutrients 2010;2(7):652-82. 20. Venn BJ, Mann JI. Cereal grains, legumes and diabetes. Eur J Clin Nutr. 2004;58:1443-1461. 22. Flight I, Clifton P. Cereal grains and legumes in the prevention of coronary heart disease and stroke: a review of the literature. Eur J Clin Nutr. 2006;60(10):1145-59. 23. Williams PG. Evaluation of the evidence between consumption of refined grains and health outcomes. Nutr Rev. 2011;70(2):80-99. 24. Heaney RP. Dairy and bone health. J Am Coll Nutr. 2009;28(Suppl 1):82S-90S. 25. Huth PJ, DiRienzo DB, Miller GD. Major scientific advances with dairy foods in nutrition and health. J Dairy Sci. 2006;89(4):1207-21. 26. Protein and calcium: antagonists or synergists? Am J Clin Nutr. 2002;75(4):609-610. 27. Heaney RP. Calcium, dairy products and osteoporosis. J Am Coll Nutr. 2000;19(2 Suppl):83S-99S. 28. Fulgoni VL 3rd, Keast DR, Auestad N, Quann EE. Nutrients from dairy foods are difficult to replace in diets of Americans: food pattern modeling and an analysis of the National Health and Nutrition Examination Survey 2003-2006. Nutr Res. 2011;31(10):759-65. 29. Jonsson T, Granfeldt Y, Ahren B, Branell UC, et al. Beneficial effects of a Paleolithic diet on cardiovascular risk factors in type 2 diabetes: a randomized cross-over pilot study. Cardiovasc Diabetol. 2009;8:35. 30. Van Loan M. The role of dairy foods and dietary calcium in weight management. J Am Coll Nutr. 2009;28(Suppl 1):120S-9S. 31. Faghih Sh, Abadi AR, Hedayati M, Kimiagar SM. Comparison of the effects of cows’ milk, fortified soy milk, and calcium supplement on weight and fat loss in premenopausal overweight and obese women. Nutr Metab Cardiovasv Dis. 2011;21(7):499-503. 32. Zemel MB. Proposed role of calcium and dairy food components in weight management and metabolic health. Phys Sportsmed. 2009;37(2):29-39. 33. Hartman JW, Tang JE, Wilkinson SB, Tarnopolsky MA, Lawrence RL, Fullerton AV, Phillips SM. Consumption of fat-free fluid milk after resistance exercise promotes greater lean mass accretion than does consumption of soy or carbohydrate in young, novice, male weightlifters. Am J Clin Nutr. 2007;86(2):373-81. 34. Josse AR, Tang JE, Tarnopolsky MA, Phillips SM. Body composition and strength changes in women with milk and resistance exercise. Med Sci Sports Exerc. 2010;42(6):1122-30. 35. Tipton KD, Elliot TA, Cree MG, Wolf SE, Sanford AP, Wolfe RR. Ingestion of casein and whey proteins result in muscle anabolism after resistance exercise. Med Sci Sports Exerc. 2004;36(12):2073-81. 36. Kammer L, Ding Z, Wang B, Hara D, Liao YH, Ivy JL. Cereal and nonfat milk support muscle recovery following exercise. J Int Soc Sports Nutr. 2009;6:11. 37. Phillips SM, Hartman JW, Wilkinson SB. Dietary protein to support anabolism with resistance exercise in young men. J Am Coll Nutr. 2005;24(2):134S-139S. 38. Hulmi JJ, Lockwood CM, Stout JR. Effect of protein/essential amino acids and resistance training on skeletal muscle hypertrophy: a case for whey protein. Nutr Metab. 2010;7:51. 39. Phillips SM. The science of muscle hypertrophy: making dietary protein count. Proc Nutr Soc. 2011:70(1):100-3. What are your thoughts regarding the lectins, gluten, and phytates found in grains mentioned on Mark Sisson’s blog: http://www.marksdailyapple.com/why-grains-are-unhealthy/#axzz1uC8fOAdh? This was an error, please delete it. What are your thoughts regarding the lectins, gluten, and phytate found in grains mentioned on Mark Sisson’s blog: http://www.marksdailyapple.com/why-grains-are-unhealthy/#axzz1uC8fOAdh? Mark seems to be the typical scaremonger when it comes to grains. He talks a lot about phytates, lectins and gluten but offers no data to support his position that they’re in any way, shape, or form harmful to the human body. To my knowledge there is no data whatsoever that supports the theory that grains damage the intestine of a perfectly healthy person. I wouldn’t pay much attention to Mark. He obviously doesn’t know much about nutrition. Wow, that last part really shows your ability to judge someone’s nutritional knowledge. Mark Sisson clearly knows a thing or two about nutrition, no one knows it all. I wouldn’t call in vitro and rat/pig data evidence per se. It’s fun to look at, but does nothing to support his claims. Just because someone links an article doesn’t mean they’re correct. While I’m on board mostly with the idea that grains and dairy are not the devil… for everyone, especially since some primitive tribes have clearly consumed both without disease, is it not hard to imagine that the abundance of grains/wheat and conventional dairy these days are not leading to some of our current health issues? Also, on one hand you rag on Paleo people for being too rigid in their nutritional selections, but then also rag on them for being flexible when it suits their needs. So, which is it? It’s easier to imagine that an abundance of food IN GENERAL is causing SOME of what we’re witnessing today. See how I didn’t single out any one certain food or make it seem like food is the only cause of disease and poor health? And, it’s both! Perhaps you need to go back and read my article? The point I’m getting across is that they say one thing, then make exceptions where they see fit. You can’t vilify milk one second and then try to justify it the other. I like to take whey protein because it is easily absorbed by the body unlike Casein. . So you pretty much have to believe in evolution for most of your claims to make any sense…actually for the whole foundation of paleo to make sense. I believe in a God who created our bodies and He has told us quite clearly what the bodies He made should be eating. And it’s NOT fast food or processed crap either. In other words, it’s also not many of the same things that makes the paleo diet so successful. Howdy, I believe your blog could be having browser compatibility issues. When I look at your web site in Safari, it looks fine however, when opening in I.
E., it’s got some overlapping issues. I merely wanted to give you a quick heads up! Besides that, wonderful site!